Considered one of the hottest new tech items of the season, the remote control drone is sure to be a home run. The Drone features an advanced stability system that makes the drone easy to operate. After one or two practice flights you will have the drone flying with ease. Once you advance your skills you can perform aerial flips. The flying time is up to 7 minutes at a distance of up to 50 Meters (164 ft.). 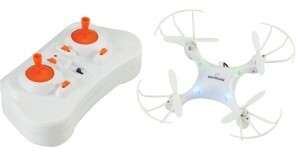 The drone includes a rechargeable battery, USB battery charging cable, and extra propellers. Some assembly is required. Contact Capital Ideas and get creative with promotional branding!